(St. Petersburg) was founded in 1992 and was originally named "The New Philharmonic Quartet". The Quartet has performed to great acclaim in different St. Petersburg concert venues, toured in Korea (1993), USA (1994), Japan (1994; 1997; 1998), Germany (1996), the Netherlands (1996), Switzerland (1996), Lithuania (1997), Sweden (1998), Turkey (1998) and Latvia (1999). In April 1994 the ensemble took part in " Children of Chernobyl" Charity concerts in Los-Angeles, and in June 1994 - in concerts of the "Hiroshima Bombing Victims" Foundation. This appeared to be the first Quartet in the world to play in the open air at the Nuclear Bombing Victims' Memorial in Hiroshima. 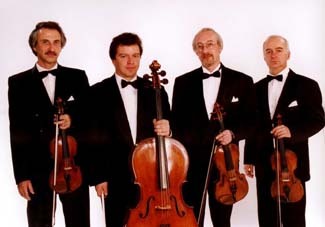 In May 1994 the Quartet took part in the St. Petersburg "Musical Spring" International Festival, and the group was invited for the next Festival in 1995. In April 1996 it was the only chamber music ensemble representing St. Petersburg musical culture during 13th European Culture Days Festival in Karlsruhe, Germany. The Quartet was given the name of the Great Russian composer Igor Stravinsky in 1999, on the recommendation of the St. Petersburg State Philharmonic, the St. Petersburg Composers' Union, the Russian Museum and Mstislav Rostropovich. The Quartet has played together with such prominent artists as: Bela DAVIDOVICH (piano, USA), Dmitry SITKOVETSKY (violin, GB), Boris PETRUSHANSKY (piano, Italy), Boris TISCHENKO (piano, Russia), Eric SALIM-MERUET (counter-tenor, GB), Yukio YOKOYAMA (piano, Japan), Neal STULBERG (piano, USA), Alexander DMITRIEV (conductor, Russia), Robert TRORY (conductor, GB). In February 1997 the group made a very successful appearance in one concert with a "Four-Stars Quartet": Gidon KREMER, Tatyana GRINDENKO, Yuri BASHMET and Mstislav ROSTROPOVITCH in frames of D.Shostakovitch's music festival at the Large Philharmonic Hall, St. Petersburg. Since 1997 the Quartet is a group member of the International Society of Friends of the Russian Museum, the biggest collection of Russian Art. The Stravinsky Quartet has made several CD and Radio recordings, featuring music by Tchaikovsky, Borodin, Rachmaninov, Shostakovitch, and Andrei Petrov, as well as an original program of popular miniatures "Happy Birthday".